Yesterday was an exciting day for fans of British comedy when the trailer for the upcoming Ab Fab movie starring Joanna Lumley was released. The TV series is much-loved and the thought of a film version is simultaneously appealing but nerveracking – will it love up the TV show? Will the larger-than-life characters translate well on to the big screen? Thankfully, the trailer looks great and the movie promises to be very funny. There’s a history of small screen sitcoms making it into cinemas that dates back to the 1970s when film versions of popular TV shows made the leap, including “Are You Being Served?”, “Man About The House”, “The Likely Lads”, “Rising Damp”, “On The Buses”, “Up Pompeii!”, and “Porridge”, to name a few. There’s an appeal in seeing our favourite characters in bigger and bolder escapades, with larger production budgets, that continues to drive film adaptations of TV shows, plus producers figure that there’s a ready-made audience who are guaranteed to pay to see the films. Also, it may be that we feel as if one of our own has succeeded – we invite sitcom characters into our living rooms via the TV and they become part of the family; when they make the transition to the cinema, we may feel supportive and want to see them do well. Incidentally, there are connections between Absolutely Fabulous and the longest-running British film series, the Carry On Films, with June Whitfield, Dora Bryan, Ed Devereux, and Wanda Ventham appearing in both. Take a look at the trailer below to see how much more glossy Absolutely Fabulous looks on film. There are many famous cameos in the trailer (Kate Moss, Jon Hamm, Stella McCartney, & Gwendoline Christie) as well some favourite Ab Fab characters making an appearance (Claudia Bing & Magda), and there’s also a delightful moment when Joanna Lumley recreates a scene from “The New Avengers”. 40 years ago in 1976, the episode called Sleeper was filmed in which Purdey tries to evade the bad guys by posing as a shop window dummy amongst other mannequins. Fast forward to 2016 and it looks as if she’s doing the same in the Absolutely Fabulous trailer when Patsy and Edina pose like mannequins in front of a shop in the south of France. Having already appeared in the Bond film “On Her Majesty’s Secret Service” in 1969 with Diana Rigg, Mrs Peel from The Avengers, Joanna Lumley appeared in several projects before coming to the country’s full attention as Purdey in The New Avengers with John Steed and Gambit. 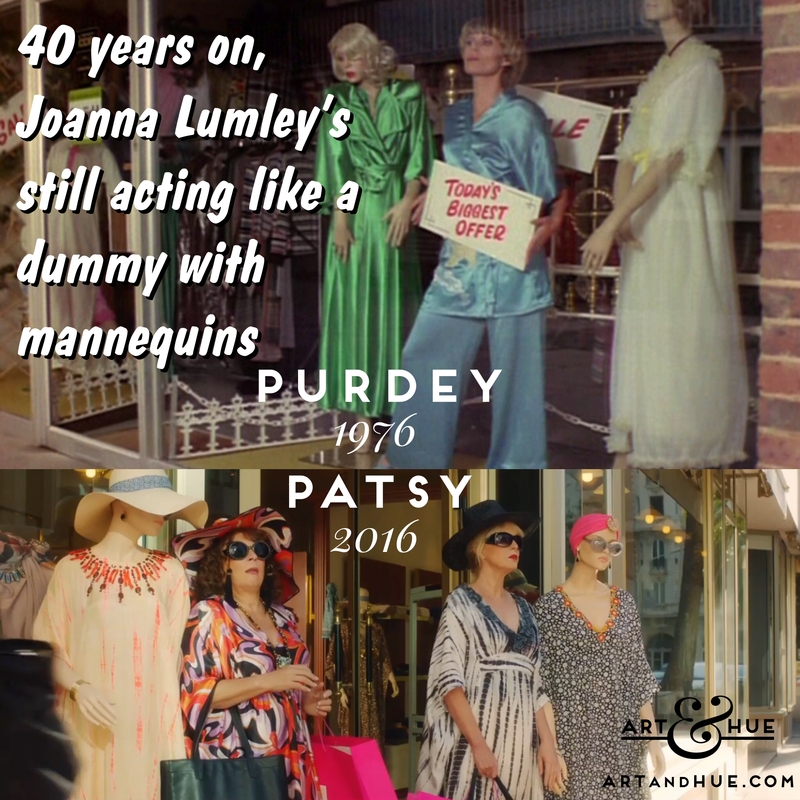 Ab Fab has referenced Joanna Lumley‘s past TV and film appearances during the TV show so it’s great to see the tradition seemingly continue in the film which will be released on the 1st of July in the UK.